Dragonwing - What held tents up? 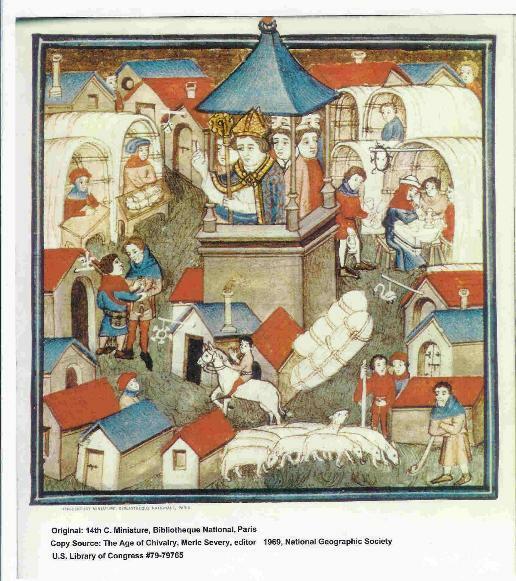 The following essay is not to be construed as a carefully reasoned, exhaustively researched tract on medieval tent construction. Rather, it is just my impressions, gleaned over the years, of what types of frames were used for tents in the past. In the beginning was the center pole ... at least that's the most basic pole structure imaginable, consisting of a single piece. Drape a piece of cloth over it and you have a basic shelter. Eventually, somebody realized that the most efficient use of cloth would be to sew a cone (or at least a slotted circle, or circular section, that could be formed into a cone)). Such a tent didn't need guy ropes, although the taller and more slender ones probably could have used "wind lines" to keep in stable in storms. One trouble with cone structures is that they don't make good use of perimeter space ... you can store stuff on the floor space next to the wall, but you can't stand up there. If you're trying to maximize the use of useable space and minimize the use of cloth, the next step would be to keep the upper part of a cone as a roof, but keep it outstretched with ropes and have the walls hang more or less straight down from the eave of the roof. The result is the sort of round tents we see in early period depictions (10th Century or so). Figure 1. A detail of an 18th C. engraving of a 16th c. painting of Henry VIII's encampment at Marquison, France in 1544. The original is no longer in existence. The artist is accurately portraying a partially knocked-down tent with some sort of eave structure. There was no such structure, but the artist (or the 18th century engraver who copied the artist's original) had to draw something that looked like a tent and not a piece of cloth lying on the ground. That the artist invented all the details, to make a nice picture. Coryn Weigle, who makes tents for Medieval Miscellany, also believes that tents used rings, which she says were made on the spot from bent saplings. As evidence, she cites a letter written by a merchant guild to a town. The guild was no longer going to patronize the town's fairs, the letter said, because there was getting to be a scarcity of available saplings in the area and the merchants weren't happy about bring in their own. The only problem with this is that merchants didn't use round tents, to the best of my knowledge. They used the saplings for booths of a different design entirely (see figure 2)). These booths were essentially semi-cylindrical structures, like a cloth Quonset hut, with the display area on one end and probably a private entrance in the back. The saplings were undoubtedly used to form the ribs of the structure. But there may other reasons for assuming a ring (or side poles, or other type of bracing). For one thing, there are a few depictions of tents showing suspiciously steep rope angles. (Figure 3 is one of them.) You see, if there is only a center pole, the angle between the tension ropes and the ground must be less than or equal to the angle of the slope of the roof. But there a few pictures showing ropes coming down from the eaves at a steeper angle than the slope of the roof. Another detail of the scene in figure 1. This suggests that at least some of the round tents in the picture had a type of eave bracing. Why would this be desirable? For one thing, it decreases the footprint of the tent. To illustrate, let's imagine a tent that's twelve feet tall, six feet tall at the eave of the roof, and twelve feet in diameter at the eave of the roof. To tension the roof, you would need to set the stakes in a ring that's twenty-four feet in diameter. If you used some sort of bracing structure, you could reduce that diameter to eighteen or twenty feet without compromising stability. That might not have been an advantage in medieval times, but in today's close-packed SCA encampments, a smaller footprint is likely to win you more friends. For another thing, the steeper the ropes are, the less likely somebody is to trip on them. That was as much of an advantage in period as it is today ... even more, perhaps, since; the lighting wasn't as good as ours is today. Of all the bracing structures, the ring is probably the simplest, lightest, and easiest to set up. That's why Dragonwing uses it for our round pavilions, although I make no claim for authenticity. I have also seen various kinds of spoke-based designs, either radiating out from the center pole or using a "wagon wheel" affair sitting on lots of side poles, with a false centerpole protruding from the wheel's axle and supporting the canopy peak. There doesn't seem to be any documentation for any of these designs, only a sentiment that they would have been within the technology of the period and would have been logical outgrowths of that technology. Before leaving this subject altogether, it's worth mentioning that Christine Robertson suspects that many of the pavilions in period pictures aren't tension structures at all, but fabric (and sometimes paneling) attached to rigid frames. I think she may be right about this. Certainly the tent in the famous Froissart picture (figure 4) stands suspiciously well without guy ropes, and a rigid frame would have made those dormer windows a lot easier to support. Figure 4. 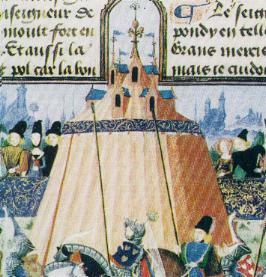 From Froissart's Chronicles. Note not only the absence of guy ropes, but what looks like some sort of internal structure (or at least a helluva lot of side poles) in the tent itself. You might also want to read the article on What Holds Them Up? which describes structures commonly used in the SCA.